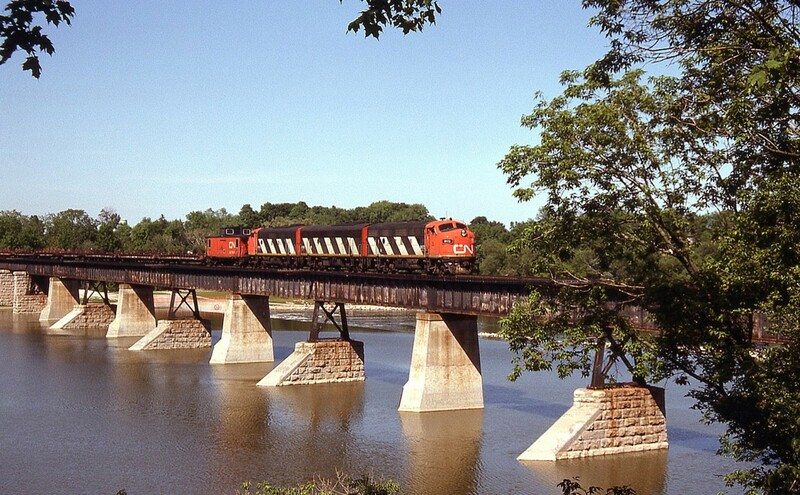 Railpictures.ca - Bill Thomson Photo: Rolling east over the Grand River bridge in Caledonia, CN 9173 leads her matching A-B-A set of zebra F7′s eastbound on the Hagersville Sub on the Steel Train. CN Steel Train on same day: Crossing in Caledonia: http://www.railpictures.ca/?attachment_id=14684 Rymal outside of Hamilton: http://www.railpictures.ca/?attachment_id=14618 | Railpictures.ca – Canadian Railway Photography – photographie ferroviaire Canadienne. Caption: Rolling east over the Grand River bridge in Caledonia, CN 9173 leads her matching A-B-A set of zebra F7's eastbound on the Hagersville Sub on the Steel Train.